In December 2011, at age 4, Nevaeh was diagnosed with stage IV high risk neuroblastoma cancer. She has gone through chemo, multiple surgeries, several bone marrows, a stem cell transplant and full body radiation. Since December 2012 she has been receiving treatment through a clinical trial at UCSF. Nevaeh has 3 siblings and a step brother. She is very close with her Great G-Ma and loves to be around family. The hospital social worker told me about Lazarex Cancer Foundation. I felt very relieved and blessed to have Lazarex help my family. I am a single mother of four. Without Lazarex it would be a hardship to make it to Nevaeh’s appointments in San Francisco every 3 weeks for check-ups with her doctor and every 3 months for scans. We live in Thornton, CA which is about 170 miles round trip to San Francisco and gas is so expensive. Lazarex’s assistance means we can make it to all her appointments. I have not reached out to any other organizations, but my hospital social worker has tried finding other funding to help us out and there isn’t any other than this one. I would like to say thank you so much to Lazarex for all their help with reimbursements. The staff is very nice and sweet. I’m very grateful for all the help and support that Lazarex has given my family. I am truly happy to be chosen to do this story about my daughter’s treatment, not only for my daughter but for Lazarex as well :). Nevaeh would love to become a singer, dancer or a doctor, and I have faith that it is in her to do so. She is very strong willed and doesn’t give up! She’s mommy’s little fighter to the end. Thank you to Tami and the staff for including my family in this program. Nevaeh is still on the clinical trial treatment at UCSF and is responding well. She is an active 10 year old. 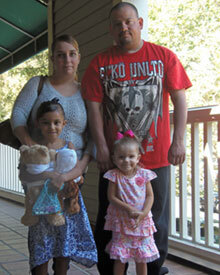 Lazarex continues to assist with the travel expenses for Nevaeh and her Mom to/from San Francisco for treatment. Your support makes this possible. 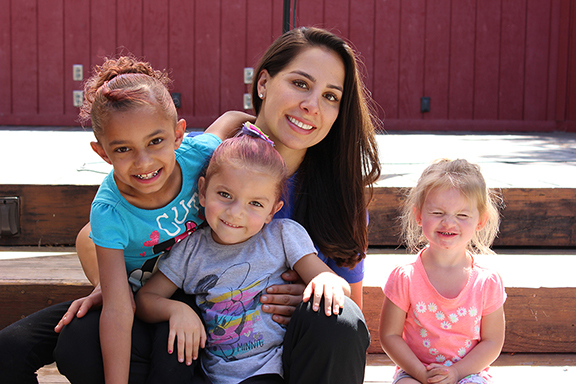 Nevaeh (left) with her younger sisters and Cynthia Sandoval of Lazarex Cancer Foundation.